Sandy Key’s beaches are forever protected by the neighboring National Seashore Preserve. If you prefer your walks on the beach, solely in the company of the sea gulls, Blue Herons and sea shells, then Sandy Key is the place for you. Sandy Key is located on 800 feet of Beach Front. 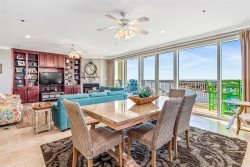 This unit has 1495 SF of living area and a 200 SF beach front balcony. Ceramic tile throughout Living, Dining, Foyer, Kitchen and Baths. Bedrooms are carpeted. Electronics include 50 in Smart TV, DVD and in Living Room, 32 in TV, in Master Bedroom and TV, in both Guest Bedrooms. This was our 2nd stay at Sandy Key and we absolutely love it. This year we even recommended it to family members who also booked a week and loved it. We will definitely be back! Thank you for helping make our vacation GREAT!! Always excellent. Already booked September 2018 vacation! Check in was quick and easy and the staff was friendly and explained all procedures thoroughly. We love Sandy Key! It is not overly crowded and beach access is super easy to get to. The pool area is perfect as it is not so large to keep an eye on little ones. We've been staying at Sandy Key for about 15 years. Love the property. Wonderful! we loved this place!! Spacious and attractively decorated! Large balcony overlooking the gulf. Very pleased with the accomodations!